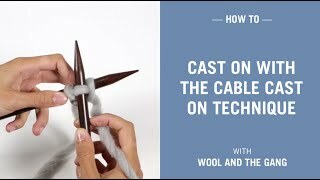 Learn how to cast off / bind off your knitting, arguably the most satisfying bit of your knitting? When you have finished knitting your piece, you need to finish it off by giving it an edge that won’t unravel – this is called ‘casting off’ (or ‘binding off’ in the US). You've worked hard, had fun and finished your project. Your pattern tells you it's now time to cast off i.e. to get the stitches off your needles. Let us walk you through how to do this. On your last row, knit 2 stitches as per normal. Now, use the left needle to lift the first stitch on your right needle (i.e. the one furthest to the right) over the second stitch (the stitch furthest to the left on your needle) and move it off the needle. You do this by inserting your left needle from left to right into the stitch on your right needle. Just make sure that your 'second' stitch on the right needle remains. 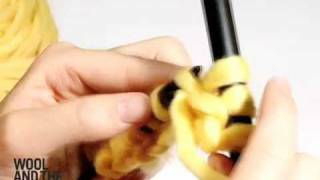 With one stitch on your right needle it's now time to knit one more stitch as per usual. You should now have two stitches on your right needle. You now need to cast off one more stitch, do so by repeating step 2. Basically lift the right-hand stitch over the left, and off the needle. You have now cast off another stitch and should only have one stitch remaining on your right needle. 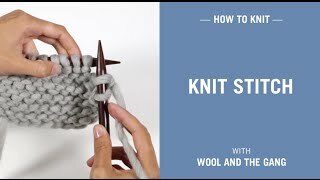 Continue doing this, knitting one stitch, casting off one stitch - knitting one stitch - casting off one stitch, until you have one single stitch left on the right needle. Cut the yarn at least 15 cm from the last stitch. Pull the yarn on the last stitch until the end pops through and comes off the needle. Ta-da you have now successfully cast off your stitches. This means that your knitting is now 'free' from knitting needles. Mission complete and hopefully successful. Go Gang! If you need any extra help always feel free to drop us a line at info@woolandthegang.com.